ravel start-up Family Transfers launches a new brand and website www.familytransfers.com. They needed a design and development partner who could not only create a fresh and fun brand identity, but also develop the website and bespoke back-office systems to enable online trading, and Zolv were there to do just that. Family Transfers was created to service a niche in the family travel market. Their unique proposition is to supply vehicles large enough not only to accommodate an entire family and all its associated baggage (prams, suitcases etc) but also provide child seats, with experienced drivers who know how to fit them. Initially launching in the London area, they plan to roll out to other UK cities and then onto European cities. Zolv knew the importance of creating a brand and style that fits with a business model and a company ethos. This has been reflected in a brand and style that is memorable and in line with Family Transfers values, together with a robust backend that sits behind a well-designed user friendly front end. 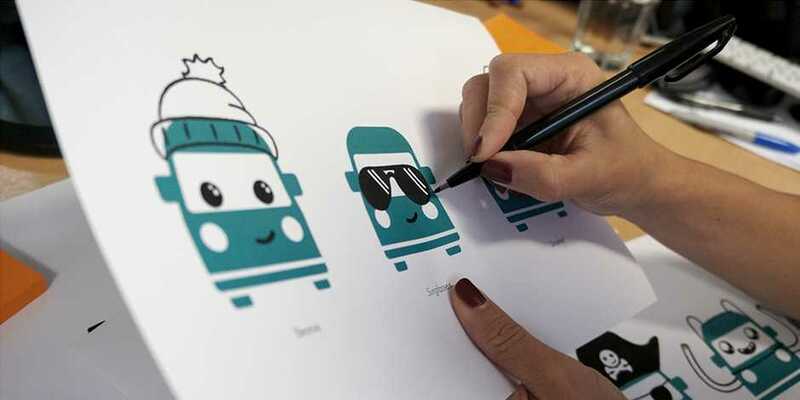 Zolv created a character of a minivan to front the brand, with Doodle features to illustrate human qualities and characteristics. Subtle animated eye-catching flourishes were also used throughout the website to reflect and bolster the fun and family branding of Family Transfers. Creating the tagline “Transfers you can all smile about” highlights and summarises Family Transfers value proposition. Full brand guidelines were produced to help Family Transfers communicate a unified message across all marketing channels and customer touch points. Showing exactly what their brand stands for with detailed elements such as the logo, fonts, colour palette and how it should be used, and guidance on the accompanying tone of voice. Along with the design and branding Zolv developed easy to use admin portals for adding new product locations, suppliers or route point’s as well as managing the general back office functions of bookings. Family Transfers required a payment gateway for the bookings so their new platform has a payment integration that supports a smooth and seamless booking process for families. Zolv introduced a user-friendly CMS to update marketing messages with a CRM Integration, combining online and offline marketing activities providing the client one view of their customer. Zolv has helped create an eye-catching website with great functionality allowing Family Transfers to react to marketing and supplier changes quickly and efficiently. For the customer, this results in an easy to navigate website; rich in quality of content, memorable branding and an overall enjoyable experience of the brand Family Transfers.